Boston President Michael Blank proudly chaired the 2013 President’s Society Mission, an exclusive, one-of-a-kind experience for members of JNF’s President’s Society, providing exclusive opportunities with deluxe accommodations and VIP access to people and places in Israel. 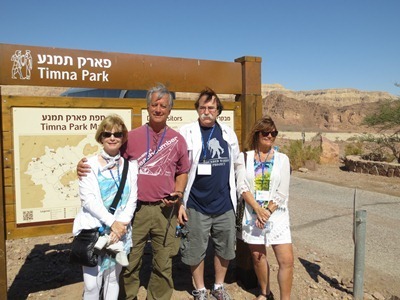 (L-R) Pat and Michael Blank with New England Board and Lawyers for Israel Society member Jeffrey Woolf and his wife Mary Woolf at Timna Park while in Israel on the 2013 President’s Society Mission. 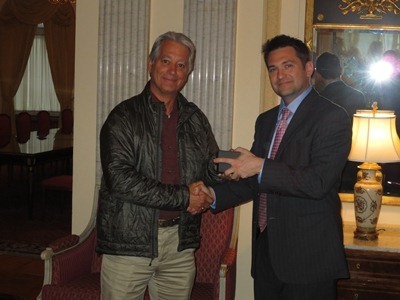 President’s Society Mission Chair and Boston President Michael Blank with Deputy Principal Officer of the U.S. Consulate General in St. Petersburg Terrence R. Flynn while in Berlin on the President’s Society Pre-Mission touring Jewish landmarks and memorials in Russia as well as major cultural and historical sites. 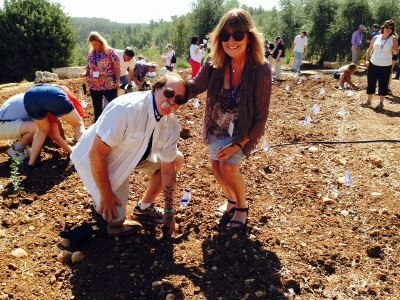 Jeffrey and Mary Woolf planting a tree at Harvey Hertz-JNF Ceremonial Tree Planting Center at Neot Kedumim while in Israel on the 2013 President’s Society Mission. The world’s only biblical landscape reserve, the Ceremonial Tree Planting Center offers visitors the opportunity to plant saplings that will later be transferred to sites throughout Israel. Each participant in this time-honored tradition receives a special tree planter’s prayer and a commemorative certificate.